Tämä tekstiili on yksi kolmentoista tekstiilin kokoemistani " Päiväkirjani neljä vuodenaikaa", Saint-Marie-Aux-Mines, Ranska 2006. Tämä tekstiili on raskas kuin yö. Sinisävyiset tekstiilini hehkuvat yleensä keveyttä ja huolettomuutta, mutta tässä tekstiilissä kaikki on toisin. Kesä 2006 oli perheelleni suruntäyteinen. Menetimme hyvin monta läheistämme lyhyen ajan sisällä. Valkoinen kadotti valkoisuutensa ja yö ja kyynelmeri tuntuivat erittäin raskailta. This textile is one of my textile collection " Four seasons of my diary", Saint-Marie-Aux-Mines, France 2006. This piece of textile is as heavy as the night. 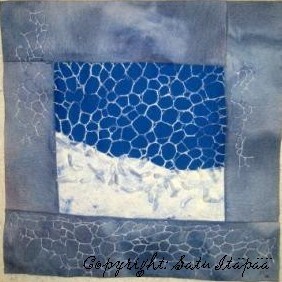 My textiles of blue-period are normally radiate lightness and positiveness. In this piece of textiles everything is different. The summer of 2006 was filled with sorrow and for my family. Many of our family members died in small period. Whiteness lost it´s brightness and the night and the sea of tears was heavy. Tämä työ on Suomalaisen keräilijän hallussa. This work is own by Finnish textile collector. AmO YAMK Muotoilija. Designer and teacher of craft and design. Lives in Finland. I am still looking for my character as a designer and artist. I love Finnish nature and Finnish history and it inspires me and my designs. I love minimalist art and simplified form. I enjoy to create new structures to fabrics. In my textile and clothing art, I use many techniques: Hand and machine embroidery, felt making, patchwork and quilting and willow weaving. 2009 Master of Arts. Design Business and Design Research. Lahti University of Applied Sciences. Institute of Design. Lahti, Finland. 2006 Diploma in Teaching Arts and Crafts. Oulu Polytecnic. Oulu. Finland. 2004 Certificate of Adult Pedagogic. University of Jyväskylä. Jyväskylä, Finland. 2002 Women´s Entrepreneurship Course. The Oulu Polytechnic. Oulu, Finland. 2000 Polytechnic degree in Clothing. The Kuopio Academy of Crafts and Design. Kuopio, Finland. 1997 Artisan Diploma in Clothing. The Ikaalinen school of crafts and design. Kihniö, Finland. 1994 Certificate in Textile Arts. The Joutseno folk college. Joutseno, Finland. 1993 High school graduate.The Tiirismaa high school. Lahti, Finland. 2009 One of the finalist in “Landscape –Let us travel” an international Art Embroidery Contest. 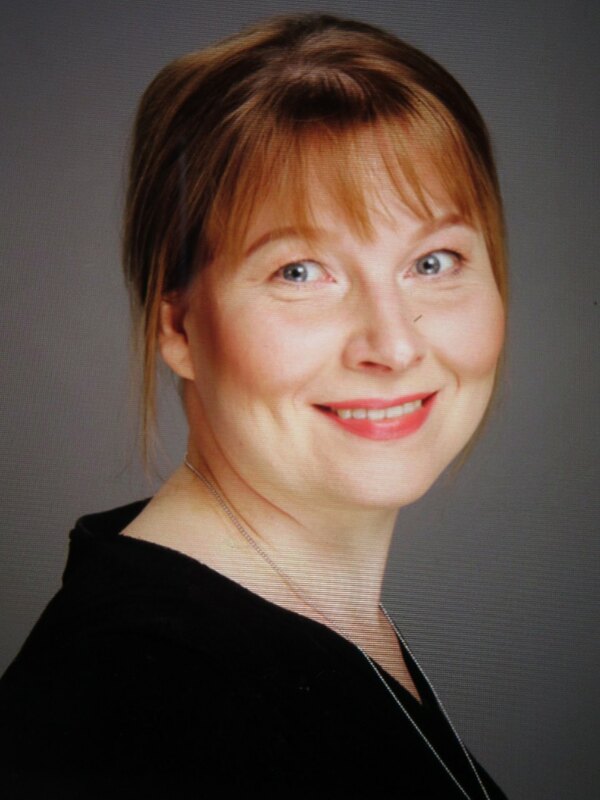 2007 Second winner in competition named Sisustusideoita villasta: Kotiliesi- magazine, Pirkanmaan kotityö and Tampereen messut. Finland. 2003 One of the finalist in MasterPieces: Freedom in Stitch, an international Free machine embroidery competition. 2003 One of the finalist in MasterPieces: Spirit & Strength, an international quilt competition for sewing machine made works. 2003 Scholarships, by Finnish Felt Group Filtti for exhibition to V International Felt Exhibition in Jämsä, Finland. 2002 Winner in the innovative use of sewing machine -award in ”Feel Free” an international quilt competition for works made with sewing machine. 2000 The best design student of clothing -scholarship by the Kuopio academy of crafts and design. 2013 "Kuin Enkelin kosketus". Mukkulan kirkko. Lahti, Finland. 2012"Nangijala". Mukkulan kirjasto. Lahti, Finland. 2011 ”Hiljaisuuden hyväilemät” Anttolan viljamakasiini. Anttola, Finland. 2004 ”Pistojen leikki.” Virinä, kaupungintalon näyttelytila. Virrat, Finland. 2003 "Neljä vuoden aikaa." Ikälän sali. Pielavesi, Finland. 2002 ”Kevyesti”. Taitokeskus Velma. Lahti, Finland. 1999 ”Nalleperhe”. Aavistus iloa. Kuopio, Finland. 2006 “Four seasons of my diary”. St. Marie-Aux-Mines. France. Länsi-Savo 6.9.2011. s. 14. Finland. Landscape –Let us travel. Art Embroidery. an international art embroidery competition, International touring exhibition –catalogue. 2009. p. 56. PFAFF. France. Kotiliesi 21/2007 p. 79-81. Finland. Les Nouvelles du patchwork no 92 Mars. 2007. p.98. France. Quilt Info 1 / 2007. p. 49-50. Belgian. Quilt Info 4 / 2006. p. 43. Belgian. Les Nouvelles du patchwork no 91 Dec. 2006. p.25. France. 12 eme Carrefour Europeen du patchwork, cataloque prestige 2006. p.60-61. Tilkkulehti Finn Quilt. 4/2006. p. 48-51. Finland. Tilkkulehti Finn Quilt. 02/2005. p. 46. Finland. Art Embroidery, a wide focus on new territories. 2004. PFAFF. p. 33. France. Me Naiset no 46. 11.11.2004. p. 15. Finland. Zig Zag by Husqvarna Viking. No 21 / 2004. p. 22-23. Finland. Tilkkulehti Finn Quilt. 03/2004 p. 20-21. Finland. Fiberarts Desing Book 7. Edited by S.M. Kieffer. 2004. p.157. Lark Books. USA. Tilkkulehti Finn Quilt. 04/2003. p.12-13. Finland. 2003 Masterpieces Spirit and Strength. p. 12, 117, 56-57. Husqvarna Viking. USA. Iisalmen Sanomat 23.10.2003 p. A 10. Finland. Pielavesi-Keitele 22.10.2003 p. 4. Finland. FiberArts. Vol 29. No 5. 3/4 2003. p. 7, 22-23. USA. Kaleva. 28.02.2003 p. 37. Finland. Taito. 1 / 2003. p. 1, 37, 50-53. Finland. Patchwork quilt tsushin no. 111. December 2002. p.56. Japan. The 10 th international quilt week exhibition catalogue 2002. p.87. Japan. Filtti. 2 / 2002. p. 10-11. Finland. Kaleva. 29.10.2002. p. 26. Finland. Zig Zag by Husqvarna Viking. no 17 / 2002. p. 47. Finland. Opistolainen, Oulun setlementti ry:n tiedotuslehti. 2 / 2002. p. 7. Finland. Etelä-Suomen sanomat. 07.08.2002. p. 30. Finland. Patchwork Quilt Tsushin. no 109 / 2002. p. 64. Japan. Magic Patch il Patchwork. no 9 /2002. p.44. Italy. Suomenmaa. 07.06.2002. p. 16-17. Finland. Tilkkulehti Finn Quilt. 3 / 2002. p. 21. Finland. Suuri käsityölehti. 6-7 /2002. p. 48. Finland. Taito. 3 / 2002. p. 9. Finland. Glorian koti. 4-5 / 2002. p. 66. Finland. "Feel Free" an international quilt competition, International touring exhibition -catalogue. 2002. p. 14, 20-21. Husqvarna Viking. France.